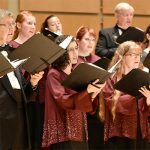 The Oregon Chorale has partnered with the choral directors of each of Hillsboro’s four high schools to establish a student internship program. In 2017, this program expanded to include Forest Grove and Beaverton School Districts. The purpose of the internship program is to inspire choral education and for the interns to experience professional musical performance. Four students are selected for each concert series to participate in the rehearsal and performances. In a time of decreasing funding for the arts, we provide all music and resources for the students at no cost. Our goal is to urge choral participation not just in college but throughout life. We also encourage students to attend our performances by providing free admission to all students by merely presenting their student ID cards at our concerts. In addition, local youth choirs are included in our December concert series.